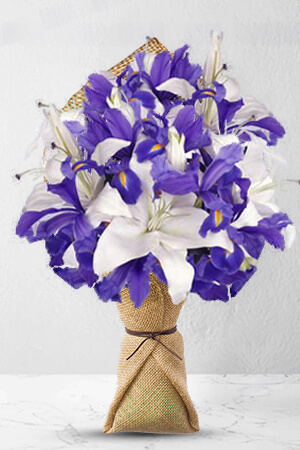 Composed to impress on the most selective people that appreciate cool and classic refinement, this charming bouquet of satin Oriental Lilies and brightly contrasting purple Iris succeeds in this purpose every time.Lilies and Iris may be sent closed/partially closed in order to prevent damage and to last longerVase not included however, to make your gift extra special we recommend a Superior Vase to leave a lasting impression. Easy to order and delivered next day. My flowers were delivered to my 94 year old mother by a lovely gentleman who took them in to the dining room table for her. Mum was very appreciative as the glass vase was quite heavy. excellent service, easy access to view flower selection and associated prices. Quick, efficient ordering process and a prompt email response to let me know the flowers had been delivered. Thank you. Awesome. She was very happy thank you! I sent a flower bouquet to a friend in Nagoya. She was so happy! They sent even more flowers than the ones I payed. Was on time and everything wonderful. Thanks zFlowers.com! I found the web site very simple to operate and would certainly use it again if the need arises.